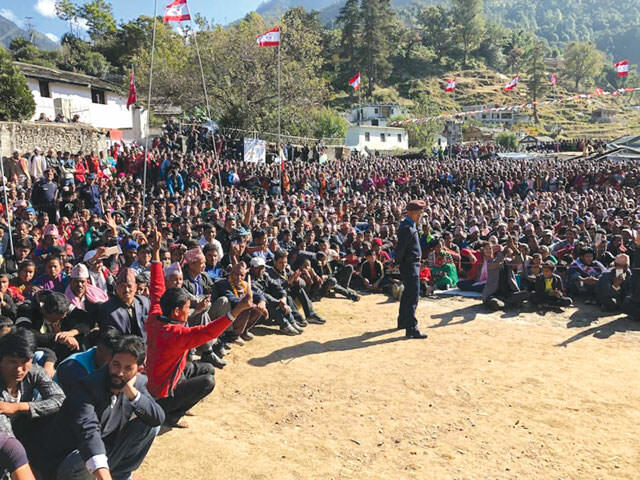 Two Grade A building contractors, who have won tickets from the NC and UML parties to contest parliamentary elections in Rasuwa district, brought local public transport to a virtual halt last month when they hired hundreds of vehicles to ferry their supporters to the Election Commission to register their candidacies. Since then, NC’s Mohan Acharya and UML’s Janardan Dhakal have tried to outdo each other by holding huge election rallies and organising lavish feasts for cadres every day. Rasuwa’s polls exemplify how expensive elections have become in Nepal. In this sparsely populated mountain district candidates have spent millions of rupees to flex their muscles to try to win votes. It is difficult to predict how much will be spent in this year’s parliamentary and provincial elections, scheduled for 26 November and 7 December. The government, political parties and constributors have set aside about Rs50 billion. But this figure does not include the money that individual candidates are clandestinely spending to win votes. Economist Keshav Acharya estimates that about Rs100 billion will be spent openly and secretly on these elections. The EC has fixed ceilings of Rs2.5 million and Rs1.5 million for parliamentary and provincial candidates respectively. If all the 1,945 parliamentary candidates stick to the EC ceiling, they will spend nearly Rs5 billion. Another Rs5 billion will be spent by the 3,239 provincial candidates, if they do not exceed the ceiling. Yet, it is an open secret that most candidates, especially potential winners, will spend much more than permitted. Piecing together information collected from candidates, party functionaries and supporters, it would be safe to say that candidates, including those vying for proportional representation seats, will spend Rs30 billion. By comparison, the EC has a budget of more than Rs10 billion, and the government is spending Rs10 billion for security. Candidates spending such a huge amount of money in a short period of time could have short-term positive impacts on the economy, but could eventually weaken democracy. Poor but principled politicians will be further marginalised, and a tiny section of wealthy but dubious people will capture power. Building contractors and businessmen first spend hefty amounts to secure party tickets, and then disburse even bigger amounts to win votes. Gyawali says that even committed cadres have become morally corrupt, and will not support election campaigns without being paid. Some businessmen have switched off their mobile phones, hoping to evade political extortion. But others are openly funding election campaigns. For them, it is an investment — and they will get their Return on Investment when the parties they’ve funded are in power. The Valleys main artery has been slashed at several places, but no one seems to care.